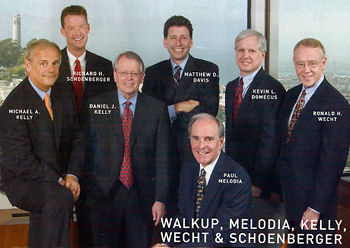 For the second straight year, the named partners at Walkup, Melodia, Kelly & Schoenberger have been selected by their peers as Super Lawyers. In addition, Kevin Domecus of the firm, who serves Of Counsel, has also been honored. The pre-eminent personal injury firm in Northern California, the name “Walkup” has been synonymous with excellence in legal representation for almost 50 years. Whether an injury is produced by a product failure, medical malpractice, medical device malfunction, vehicle accident or workplace injury, Walkup lawyers are tough, thorough, creative and ethical for their clients. In trial, arbitration or mediation, our lawyers consistently rate high levels of client satisfaction. Over the past 12 months, our Super Lawyers have obtained seven figure jury verdicts and mediated settlements; been elected to office in prestigious national societies; provided specialized teaching to lawyers home and abroad and continued to fashion an outstanding track record of success in a variety of case types. This year Paul Melodia obtained the largest verdict in a medical negligence case in the history of San Joaquin County. Michael A. Kelly and Richard H. Schoenberger concluded seven-figure settlements in product liability, premises and industrial injury cases; both also traveled to Eastern Europe to teach young lawyers in the former Soviet Union about the adversary system. Matthew D. Davis continued to make a name for himself in the field of consumer class actions. Our Super Lawyers are leaders in such organizations as ABOTA, the International Society of Barristers, NITA and the America College of Trial Lawyers. Paul, Mike, Rich and Dan have all been named among “The Best Lawyers in America.” During the past year, both the popular press and legal periodicals have profiled the firm’s many successes. Walkup lawyers continue to approach all cases the same way – intense preparation and a manifest willingness to try any case that cannot be settled on terms that are beneficial to the client. We also salute Paul and Mike’s selection to the Super Lawyers “Top 100” list , in further recognition of the firm’s pre-eminence and successes.